Many people are familiar with the deep yellow color and the intense bitter flavor of goldenseal extract (Hydrastis canadensis). What most do not know is that the compound responsible for this characteristic color and taste is berberine—an isoquinoline alkaloid present in goldenseal and numerous other medicinal plants. Barberry root (Berberis vulgaris) and Oregon grape root (Berberis aquifolium) are other examples of berberine-rich plants that have been used in herbal medicine traditions for millennia. Modern research shows that berberine HCl, an isolated phytochemical from these plants, has its own potent therapeutic benefits. 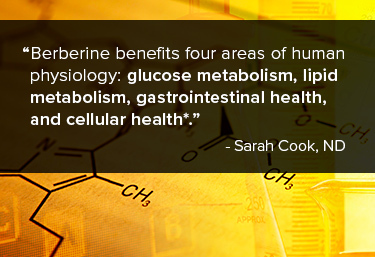 * In a broad sense, berberine benefits four areas of human physiology: glucose metabolism, lipid metabolism, gastrointestinal health, and cellular health. * The following is a brief discussion of berberine benefits and the associated dosing recommendations. Clinical studies have evaluated berberine (berberine HCl) at dosages ranging from 500mg to 1500mg per day for as long as six months in adults.1 The most common and most effective dosage appears to be 1500mg a day, given in three divided doses with meals. There is insufficient evidence to support its use in children. The most common side effect of berberine supplementation is gastrointestinal discomfort. Postprandial and divided dosing is an effective strategy to minimize this risk.1 If gastrointestinal irritation continues, the dosage can be decreased accordingly. Dong H, Wang N, Zhao L, Lu F. Berberine in the treatment of type 2 diabetes mellitus: a systemic review and meta-analysis. Evid Based Complement Alternat Med. 2012;2012591654. Pérez-Rubio KG, González-Ortiz M, Martínez-Abundis E, Robles-Cervantes JA, Espinel-Bermúdez MC. Effect of berberine administration on metabolic syndrome, insulin sensitivity, and insulin secretion. Metab Syndr Relat Disord. 2013;11(5):366-9. Zhang H, Wei J, Xue R, et al. Berberine lowers blood glucose in type 2 diabetes mellitus patients through increasing insulin receptor expression. Metabolism. 2010;59(2):285-92. Yu Y, Hao G, Zhang Q, et al. Berberine induces GLP-1 secretion through activation of bitter taste receptor pathways. Biochem Pharmacol. 2015;97(2):173-7. Dong H, Zhao Y, Zhao L, Lu F. The effects of berberine on blood lipids: a systemic review and meta-analysis of randomized controlled trials. Planta Med. 2013;79(6):437-46. Hu Y, Ehli EA, Kittelsrud J, et al. Lipid-lowering effect of berberine in human subjects and rats. Phytomedicine. 2012;19(10):861-7. Kong W, Wei J, Abidi P, et al. Berberine is a novel cholesterol-lowering drug working through a unique mechanism distinct from statins. Nat Med. 2004;10(12):1344-51. Gu S, Cao B, Sun R, et al. A metabolomic and pharmacokinetic study on the mechanism underlying the lipid-lowering effect of orally administered berberine. Mol Biosyst. 2015;11(2):463-74. Pisciotta L, Bellocchio A, Bertolini S. Nutraceutical pill containing berberine versus ezetimibe on plasma lipid pattern in hypercholesterolemic subjects and its additive effect in patients with familial hypercholesterolemia on stable cholesterol-lowering treatment. Lipids Health Dis. 2012;11123. Cao Y, Pan Q, Cai W, et al. Modulation of Gut Microbiota by Berberine Improves Steatohepatitis in High-Fat Diet-Fed BALB/C Mice. Arch Iran Med. 2016;19(3):197-203. Lv Z, Peng G, Liu W, Xu H, Su J. Berberine blocks the relapse of Clostridium difficile infection in C57BL/6 mice after standard vancomycin treatment. Antimicrob Agents Chemother. 2015;59(7):3726-3735. Hawrelak J. Giardiasis: pathophysiology and management. Altern Med Rev. 2003;8(2):129-142. Li GH, Wang DL, Hu YD, et al. Berberine inhibits acute radiation intestinal syndrome in human with abdomen radiotherapy. Med Oncol. 2010;27(3):919-25. Chatuphonprasert W, Nemoto N, Sakuma T, Jarukamjorn K. Modulations of cytochrome P450 expression in diabetic mice by berberine. Chem Biol Interact. 2012;196(1-2):23-29. Guo Y, Chen Y, Tan ZR, Klaassen CD, Zhou HH. Repeated administration of berberine inhibits cytochromes P450 in humans. Eur J Clin Pharmacol. 2012;68(2):213-217.